I am fortunate in many ways. As I have fly fished in many places in the world and every year I normally host a few fishing trips to a stunning destination as part of my strange wonderful job. 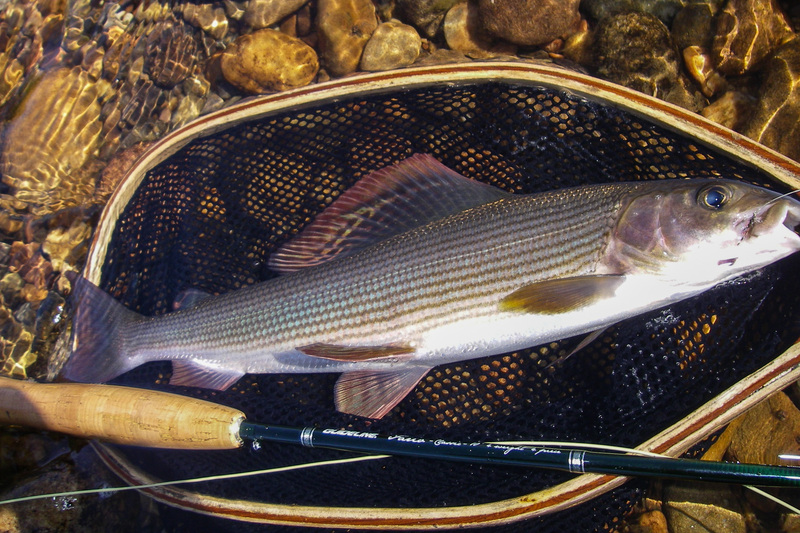 One that I have been doing for seven seasons now is Grayling fishing in Norway. This is a location that was once often frequented by English Victorian gentlemen in pursuit of big scenery, wild places and wild fish, in fact there is a beat on the river still called England, where two brothers used to summer and if you ever go you will see why they went, it’s a simply breathtaking spot. It is a big country with big rivers and one of it biggest is Norway’s River Trysil where we are based while doing this trip. The Trysil lies about three hours comfortable drive north east from Norway’s capitol Oslo, close to the Swedish boarder in vast wilderness areas with plenty of opportunities for keen, novice and expert anglers alike. I adore this region and I am lucky to have fished this area many times now, with one of the best guides I have ever worked with, Mr Espen Eilertsen. Espen is also a very good friend , who I met many years ago at the Dutch fly fair and is a regular to our Irish Fly Fair in Galway in November, he is not only a talented fly angler, but also a great fly dresser, caster, cook, which any who have stayed with him can testify and a true outdoors man and on top of all that he is really good company and speaks perfect English . Next year we will be hosting a holiday together again in September. I will tell you about the last one to give you a flavour of the trip and the place. After landing with our guests Trevor Green , from my home town Belfast in N.Ireland, Peter Bass from England, Scot Mac and Marc Light good friends from Scotland , ( yes I know it sounds like the old jokes , did you hear the one about the Irish Man , Scots Man , English man ). On arrival we were met by Espen and then we were on our way to our new home driving north though spectacular scenery. We stay in a nice wooden comfortable cabin , set on the banks of the awesome river, you could almost cast to it from the from door, not really but you can sit and watch fish rising from the door or dining room, it’s a fabulous setting looking out onto the wide, crystal clear river with the majestic mountains rising above. This is somewhere that makes me feel good about the world, it is a place not only to fish but at times, to just sit and relax and take in where you are and enjoy the magnificence of the setting. As anglers sometimes we can forget how lucky we are, to just be where we are , fly fishing should be much more than catching fish, it is also about the beautiful places we get to pursue our quarry in, that maybe on your local river or somewhere else but remember on occasion just take time to look around you and drink it all in . A wise angler once wrote “I fish for trout because they live in beautiful places” and with this setting you will agree, trout do live in exceptionally beautiful places as do their wonderful cousins the grayling. Normally my job on a hosted trip is to help the team if they need casting lessons, reading the river, wading, fly choice or some tactics but to be fair on the last trip , they were all pretty experienced anglers and I only had to help with some casting a few times but not often, just a little help with distance casting and some Spey casting, so with Espen and myself sharing the work . I did also get a chance to fish a bit. I love fishing new places, with different tactics and with grayling not being native to Ireland, it is wonderful to catch these magical fish. I have always adored grayling from the very first time I caught one many years ago in Scotland which was on the river Tummel, when I worked with Dave Havers for Mitchells Of Pitlochry, I was in my mid-twenties then, okay sorry about the reminiscing, I do that from time to time, back to Norway. The Trysil river has some lovely wild brown trout with fantastic markings but the Grayling are the main quarry. The fish we got where all sleek stunning fish designed to live in big fast rivers, with beautiful markings, not massive but a nice average size, with the odd big one among them. We use at times heavy nymphs with short line Czech and Polish nymphing techniques, but we mostly catch them on dry flies with caddis, small olives and wood ants being the best patterns, I was amazed at the size of the wood ants nests they were massive like huge buildings in the forest some where many feet high. Espen knows the river well as he grew up fishing it and drives us from spot to spot, over the days, driving though this part of Norway is a joy, rarely do you see many other cars, in fact Marc joked when we got held up by a small heard of wild Reindeer, shouting at last a Norwegian traffic jam. We also fish some other big rivers which are also stunning including Glomma and the Rena both fantastic rivers also. What You Will Need. I normally bring two rods. A Guideline rod for dry fly fishing around 9 feet that casts a four or five line and a longer nymph rod 10 feet for a 4 or 5 line These rods are matched with floating lines. You will also need sunglasses, these help not only on bight days but help when wading stony rivers, helping you see the obstacles and good waders, jacket, I would also bring a wading staff and a range of flies mostly caddis pupa patterns for Czech Nymph style and a selection of dries for your rising fish, small mayflies, caddis and ants. The basic method of fishing with Czech nymph is the so-called short nymph or rolled nymph. When using this method, we are catching fish practically under the tip of the fly-fishing rod and commonly without making use of the fly-fishing line, the end of which does not touch the water surface in most situations. After casting upstream, we leave our flies sink to the bottom gradually and follow their movements downstream with the tip of the rod. We keep the rod in the hand with the arm stretched in front of us all the time. When the flies reach the area just below us, we lift the flies from the bottom with a movement of the rod upwards and cast again. The main condition of success of the method of short nymph is keeping a permanent contact with the flies. A bite of a fish shows up as a movement of the leader/fly line upstream or to the sides, or just like a short stop of the whole system during the travel of the flies through the water column. When we are not able to keep our contact with the flies, our chances to observe a take is markedly reduced. Some guys like to use a pimp a small float as a slighter. There are several things that can help us to keep our contact with the flies. First, it is, however, proper leading of the flies and “copying” their movements in the water by rod and line, while trying to keep the leader (cast) stretched all the time. Another important help is also the length of the leader. When using a short one, keeping good contact with the flies is easier than with a long one. Finally, it is very important to have a corresponding weight of the fly system. Keeping contact with heavier flies is much easier than with lighter ones (lighter flies, however, behave more naturally in the water). Czech nymphs are not necessarily to be used only in the “short” way, but with similar success also in the “long” way, when we cast flies farther and lay the line on the water. Then we identify the takes by movements or stop of the line tip. In this way we can fish upstream, across the stream and downstream as well. When fishing, we combine both methods (short and long) according to given conditions. Traditional dry fly fishing works as normal casting upstream. Upstream presentation is NORMALLY for fly fishers in the U.K or Ireland the obvious choice for several reasons. Firstly, you are in the trout’s blind spot, right behind it. Secondly, you are less likely to have ‘cross-flow’ drag to contend with; and thirdly, you can pick the fly off the water without disturbing the trout that you have covered. Disadvantage of upstream fishing is that if you don’t fish your way up to your target, you can easily line and spook unseen fish when you finally cast. That said interestingly on these big Norwegian rivers , casting dry flies across and downstream is a normal tactic and downstream presentation works well if some slack line is given on the water between you and your target fish , by mending or learning to make ‘parachute’ casts , when it is done properly to a confident feeder, you will rise more fish than you might expect as the first thing the fish sees is your fly. You can also stop the rod at the vertical on your forward stroke, and the line and leader will fall short of your target. now let the flow take your fly and leader. as they straighten out, down to the feeding fish, as you lower the rod to feed the remaining slack onto the water. If you got your range right during the false casting, your fly should float down to the trout’s or graylings nose, before the taut line checks your fly. Fishing this part of the world is wonderful, I recommend it to anyone that loves wild fishing on big wild rivers. The River Trysil flows through a typical Norwegian forest – long still flowing sections ideal for classic dry fly fishing and faster riffles that are quintessential nymph stretches; the river enjoys an extremely rich insect life and we often fish THE FISHSPOT where there has been some excellent work done in researching the fish in that area. The River Glomma has excellent dry fly and small nymph sport throughout the year for grayling and trout. If you are interested in fishing there email me.